Most galaxies in the universe have at least one thing in common: supermassive black holes tend to sit in their centers, silently gorging on interstellar gas and dust and obliterating anything that comes within range of their event horizon. But scientists know very little about the origin of these behemoths or how they got to be so supermassive. "We don't understand particularly well how black holes grow," says James Mullaney of the University of Sheffield. "Especially how they grew back in the early universe, when the first stars were starting to form." But Mullaney and his colleagues may have accidentally stumbled upon a major clue. In a study published Monday in Nature Astronomy, they report evidence that black holes might tear apart and "consume" entire stars much more commonly than was previously assumed. "The results came out purely by chance really, quite like a lot of scientific discoveries," Mullaney says. "We were initially looking to find out what happens when galaxies collide." But when his team observed 15 galaxies in 2015, they noticed that one of them had changed since a previous survey in 2005. They saw a strong flash of light—the fingerprint of a Tidal Disruption Events, or TDE. It sounds like something a surfer might grouse about, but a TDE is when a star strays too close to a black hole and gets totally torn apart. It's lights out for the star and dinner time for the black hole. A TDE isn't inherently surprising. But finding it in a random batch of 15 galaxies was pretty strange. "Until now, such events have only been detected by surveying thousands or tens of thousands of galaxies," Mullaney explains. "And even then, you might not always find one." Of course, it's possible the team just got really, really lucky. But Mullaney says they've calculated the odds of such an event being purely due to chance, and they found them to be something like one in 100. What's more likely, he explains, is that they've stumbled upon a circumstance—galaxy collision—that makes TDEs happen more frequently. "It’s a little bit like if you surveyed a population of non-smokers—you might only identify that one had lung disease in a pretty large group. Whereas if you sampled a population of smokers, you’d find one in fifteen had lung disease, because smoking causes lung disease," he says. "We found one of these events taking place in a much smaller group than we'd expect," so it seems likely that colliding galaxies are at risk for TDEs in the way that smokers are more likely to have lung disease. More research is needed, especially since there is the possibility—however slight—that Mullaney's team simply got really lucky. But the group hopes to look at many more colliding galaxies in the hopes of raising their confidence level. If they really have landed on something that makes a TDE more likely to occur, they should be able to find loads more. "It's not going to affect the human race or anything like that," Mullaney says. 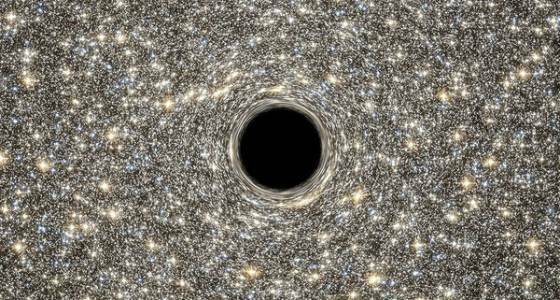 "But it could help us finally understand how these black holes are growing." It's generally been assumed that black holes consume interstellar gas and dust for the most part—not stars themselves. But Mullaney now believes black holes could get as much as a quarter of their bulk from swallowing stars. "If these events are happening as frequently as our study suggests," he says, "then actually swallowing stars suddenly becomes a feasible way for black holes to grow."